Experience redefined luxury living at Camden Flatirons in Broomfield, CO. We offer spacious one and two bedroom apartment homes filled with modern conveniences and high-quality finishes in our pet-friendly, non-smoking community. Each Broomfield apartment opens into the kitchen, dining, and living space with a seamless flow created by an open-concept layout. Our functional and stylish interiors include stainless steel appliances, white quartz countertops, dark hardwood-style flooring, large windows to let in natural light and private patio/balcony space to take in breathtaking Rocky Mountain views. Take advantage of USB enabled outlets, walk-in closets with custom shelving, full-size washer and dryer, and more to provide you with more time to do what you love. Living at Camden Flatirons means access to amenities that allow you to transform your mind and body, entertain friends, and save time and money. Drop your costly gym membership and visit our 24-hour fitness center complete with cardio equipment, free weights, and resistance training equipment. Take in the clean mountain air when you spend the day poolside, soak in our 18-person hot tub, enjoy a meal using one of three outdoor grills, and get cozy by the outdoor fireside lounge. Camden Flatiron’s resident social lounge has everything you need to entertain friends with a large screen TV, a community Xbox and PS3, poker table, and pool table to choose from as well. We offer Wi-Fi in all common areas, but when you need a quiet place to get work done head to the onsite Internet Café with computers, a printer and complimentary coffee. We want your pets to love where they live too! Take advantage of manicured walking trails; visit our expansive, one-quarter acre private dog park with agility equipment and keep the dirt out of your home with the onsite dog washing station. Environmentally friendly upgrades also include energy-efficient windows, recycling onsite, electric car charging stations, and bike storage with a repair station. Our convenient Denver apartments put you in between the popular Interlocken and Broomfield, CO neighborhoods puts you close to favorites like Village Tavern, Nighthawk Brewery for fun year-round activities and E’s Just Good Eats for breakfast, lunch and dinner. Find everything you need nearby in the Flatiron Crossing shopping mall, WalMart Supercenter just 8 minutes away and DanoneWave – a plant based grocery store. When it’s time to get outside, hit the slopes, hike or bike, Camden Flatirons provides easy access to the Interlocken Loop via Highway 36 and the RTD Bus line with a stop close by for a quick commute to Boulder and Denver, CO. Residents also receive a technology package included in total monthly rent. This money-saving package includes high-speed internet up to 150 Mbps and over 140 digital video channels through Xfinity. Use the Xfinity Go app on your smartphone or tablet to access your digital video anywhere. 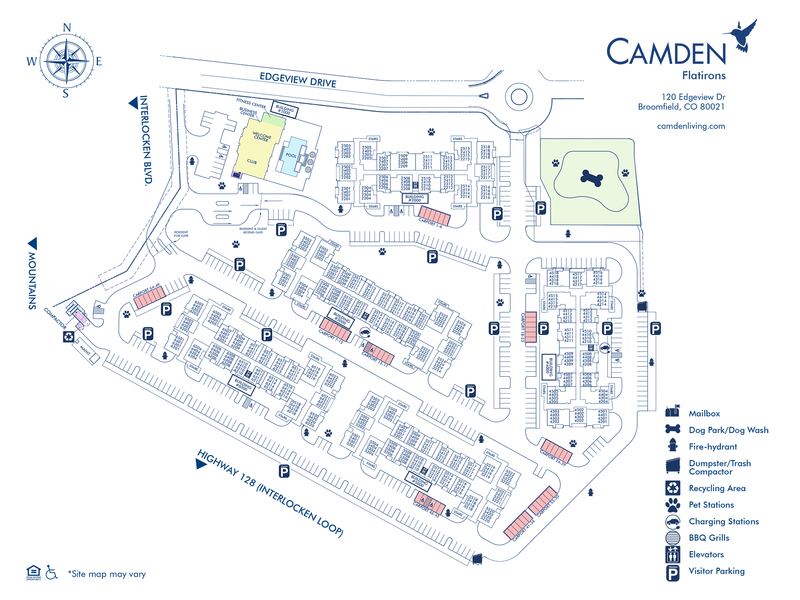 Find compromise free living at Camden Flatirons. Check out our available floorplans and schedule a tour today! Servomax Virtu coffee maker in lounge - 7,000 possible combinations! At Camden, your pets are family too! We welcome cats and dogs, up to three pets per apartment home. Call us with any pet-related questions! Restricted breeds: American Pit Bull Terrier, American Staffordshire Terrier, Staffordshire Bull Terrier, any mix of the previous breeds, or any other dog or breed deemed aggressive. We'll save a spot for you! We offer one covered parking permit per leaseholder. The parking garage under each building is on a first-come, first-served basis. Carports are available to rent for $50 per month. Also, there are reserved garage parking spaces available to rent for $100 per month.